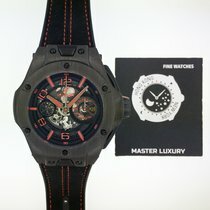 Designed in the attractive combination of stunning black and passionate red as an aesthetic homage to Ferrari, this exquisite wristwatch from Hublot is limited to 500 pieces, embodies the bold innovation-oriented spirit and impressive technical expertise of both brands and celebrates their fruitful partnership in apt style. Displaying central hours, minutes and flyback chronograph seconds as well as small seconds at nine o'clock and date combined with 60-minute counter at the three o'clock position, the sapphire dial with luminescent details and rhodium-plated Ferrari logo shows the esteemed self-winding Unico caliber that boasts 38 jewels and stores a noteworthy 72-hour power reserve. The movement is also seen through the transparent back of the 45mm case which is made of carbon with black and red composite resin and mounted onto a black Alcantara strap with red stitching and black rubber, secured on the wrist with a mat carbon and black PVD-plated titanium deployment clasp. Featuring sapphire crystal with antireflective coating on both sides, the case provides 100m water resistance.